Alberto Duman (born Italy 1966) and Harald Smykla (born Germany 1961) have each been London-based for over two decades. Trailer is a fleeting summer exhibition that presents a quick look at their recent individual activities – it is an interim event – a preview involving cinematic references through film, performance drawing, and photography. Alberto Duman’s Disaster Movie is a short epic staged in an empty swimming pool where an eerie and unnatural event of catastrophic proportions seems to unfold, suddenly turning the familiar into the uncanny. By employing the dramatic devices of suspense and crescendo both visually and aurally, Disaster Movie constructs Duman’s metaphorical ‘plot’ out of absence, making the invisible force that suddenly animate the pool’s water its main unseen actor. Harald Smykla’s Movie Protocols are pictographic shorthand notations of films, created in real time as he watches them. Swift line drawings chase one another across paper as he makes a graphic record of every take. Capturing film through live drawing turns the usually passive process of watching a movie into an active one that generates its own visual language. Hectic cuts and on-screen movement result in rapid graphic ciphers, and when the camera lingers, he can generate pictorial detail, even recognizable portraits of actors. A selection of recent Movie Protocol drawings will be featured, and Smykla will perform a new Movie Protocol during the private view for the exhibition. To parallel Duman’s Disaster Movie, Smykla has chosen to draw another ‘disaster movie’: Godzilla. Duman’s Terrible Tuesday is a larger-than-life printed metal facsimile of a copy of the now defunct London Lite newspaper of 18 September 2008. The headline ‘Terrible Tuesday’ refers to the stock market crash that year – an economic, rather than a cinematic, disaster. The work is a deliberately engineered freeze-frame: Duman has singled out this item from the ‘trash of history’ and presents it as object of aesthetic appreciation; the impermanent paper becomes a more physical object, inserted back into contemporary socio-economic reality. His Waiting for Nostalgia series of photographs were staged and shot in the desert of Sharjah, UAE. 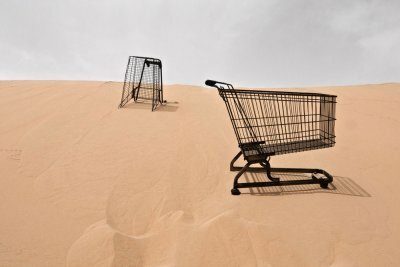 Shopping trolleys, imported to the desert kingdom and sprayed oil-black, were prepared as part of Duman’s participation in the Sharjah Biennale (2009), and appear as ‘lost fragments of a previous order or even as eerie manifestations of a future one’. 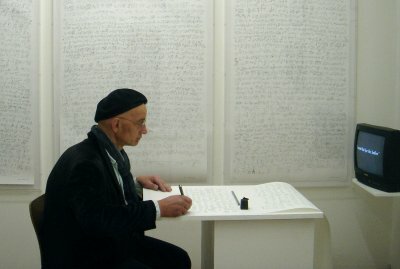 Harald Smykla has exhibited and performed throughout Britain and Europe and presented work in Israel and Croatia during the MAP Live Performance Art Exchange programme. He performed as part of East Wing Collection VIII (2008-09) at the Courtauld Institute, London, and more recently at the Quad film festival in Derby, where his Movie Protocol drawings were exhibited (2010-11); and at the launch of UnSpooling – Artist & Cinema at Cornerhouse, Manchester (2010). Alberto Duman is a conceptual and installation artist who uses print, sound, light, photography, video and film. He graduated from Camberwell College of Art with an MA in Printmaking in 1996, before turning his focus to Public Art. He has held residencies, is a researcher and lecturer, and his installation project for Sharjah was published in the 2009 Sharjah Biennale catalogue.